Sean Rafferty's guests include Westminster Abbey organist James O'Donnell, pianist Daniel Grimwood and singers from the Royal Academy of Music. 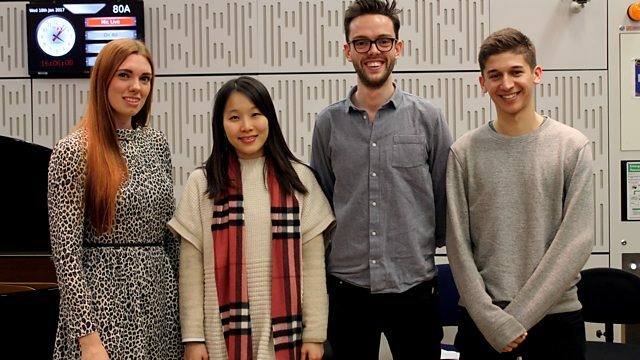 Sean Rafferty's guests include Organist and Master of the Choristers at Westminster Abbey James O'Donnell, pianist Daniel Grimwood performs extracts from his new CD of Adolf von Henselt's music live in the studio, and singers from the Royal Academy of Music - Katie Stevenson and Nicholas Mogg accompanied by Yi-Shing Cheng and Michael Pandya perform English songs ahead of their concert at Wigmore Hall. Performer: Katie Stevenson. Performer: Yi-Shing Cheng. Performer: Nicholas Mogg. Performer: Michael Pandya. Performer: Katie Stevenson. Performer: Yi-Shing Chen. Performer: Höör Barock. Performer: Dan Laurin. Tchaikovsky: The Nutcracker: Berliner Philharmoniker/Rattle. Choir: Choir of Westminster Abbey. Conductor: James OʼDonnell. Ensemble: Les Siècles. Conductor: François‐Xavier Roth. Ensemble: St. Lawrence String Quartet. Orchestra: San Francisco Symphony. Conductor: Michael Tilson Thomas. Performer: Gerald Finley. Orchestra: Bergen Philharmonic Orchestra. Conductor: Edward Gardner.